Abby Rose Child Doll by LInda Rick for Ashton-Drake Galleries. 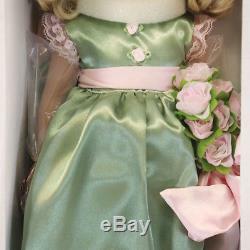 Abby Rose Child Doll Ashton Drake Galleries. A little girl is certainly blessed to be named for her grandmother, especially when her grandmother has such a pretty name as Rosemary! Thats where Abby Rose got her middle name, and the inspiration for her beautiful satin dress and her hat trimmed with roses. This realistic child doll has been created by the award-winning doll artist Linda Rick in her famously lavish style. 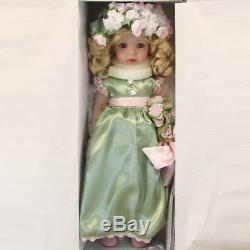 Abby Rose is an exquisitely handcrafted child doll with the elegant details for which Linda Rick is so well known. Shes so full of little-girl charm, shell win your heart immediately! 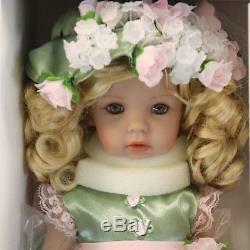 This realistic child doll is handcrafted in vinyl with hand-painted features, green eyes, and golden curls. 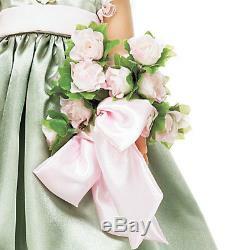 She wears a lovely satin dress with chiffon rosebud buttons on the bodice, a pink chiffon sash, and pink lace trim. 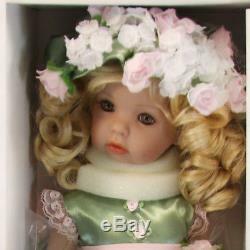 A satin hat, embellished with pink and ivory roses and babys breath, completes her dress-up ensemble. 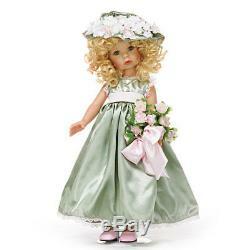 This impressive child doll even carries a fancy bouquet of pink fabric roses to remind her of her grandmother. Fine adult collectible, not intended for children under 14. Measures approximately 18 (45.7 cm) H. We have an actual store in Ladysmith, WI and have been in business for 27 years! We take pride in being friendly and helpful because we not only love dolls and bears but enjoy our customers. All items come from a non-smoking warehouse. The item "Abby Rose Child Doll by LInda Rick for Ashton-Drake Galleries" is in sale since Monday, June 4, 2018.